Mets Season Preview: Who Could Finish Behind the Mets? Yankees Season Preview: How Does the Second Wild Card Change Things? 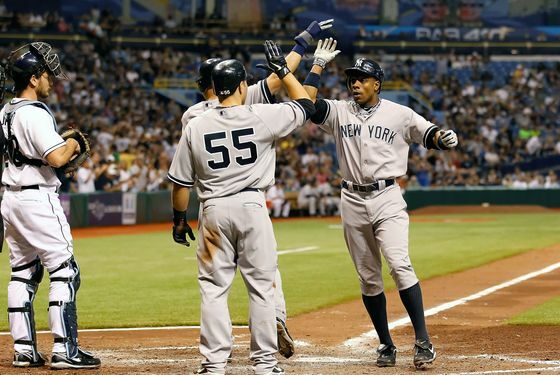 Our preview of the 2012 Yankees season continues with a look at how the changes to the playoff format affect teams in the American League East. Teams from the American League East have won thirteen of the seventeen Wild Cards since 1995, and since 2003, the A.L. Wild Card has come from one of the other two divisions just once. Which is to say: The American League East is traditionally a tough division, especially now that the Rays have built a team that can compete with the superpowers in New York and Boston. But this year, of course, brings a change to baseball's postseason format: Two Wild Card teams from each league will now meet in a one-game playoff for the right to advance to the division series. And so for the first time since before the strike, there's a huge incentive to winning one's division: Previously, the Wild Card meant lack of home field advantage a more difficult first-round opponent. Now, failing to win one's division also means having to take part in a crapshoot of a one-game series, and make no mistake, appearing in this one-game playoff may count as a postseason berth, but simply reaching it won't feel like much of an accomplishment for the team that loses. But the new format effectively penalizes teams in difficult divisions, which is to say, it could penalize teams in the American League East. Consider the 2010 season, for example: The Yankees that year had the second-best record in the entire American League, behind a team in their own division. Under the old format, the Yankees' basic postseason path was essentially identical to the division winners': A best-of-five division series, then a best-of-seven ALCS. There's an argument to be made that this was fair: The Yankees had been the second-best team in the American League that season; why should they have had a more difficult path simply because they played in a difficult division? Under the new format, however, not only will Wild Card teams face that elimination game, the system is designed to make things difficult for the winner going forward by forcing them to use their best available pitcher in the Wild Card round, thereby affecting his availability in the division series. Perhaps pennant races are good for baseball, but they're not necessarily desirable for a quality team in a difficult division that under the old system would have earned a spot in the division series for a second-place finish. That team — the quality one from the difficult division — could very well end up being the Yankees this season. Brian Cashman has admitted that the 2010 Yankees — the team with the second-best record in the American League that finished behind Tampa Bay in the A.L. East standings — didn't try to win the division late in the season, because of the old playoff format. Said Cashman earlier this year: "The division title was rendered meaningless the way the set-up was. It really meant nothing more than a T-shirt and a hat." That kind of thing won't happen again, though, whether it's the Yankees or the Rays or the Red Sox looking up at another team in the division standings. Winning the division gets you a lot more than a better hat now.